Point-to-point tweed tone - at an old-school price! For the money, it's amazing value. Go tweed, go Juketone! Excellent value for money for a hand-wired tweed replica. Easy to setup and use. Sounds great with brighter pickups. Could do with more presence in upper frequencies. The most coveted small combos of all are the tweed amps made by Fender in the 1950s - particularly the Champ, Princeton and Deluxe, secret weapons for legions of top players and used for some of the most iconic guitar tracks ever recorded. Not surprisingly, the simple circuits of these amps have made them favourites for DIY builders, while many boutique amp companies started with tweed replicas, many of them superbly-built, but high-priced. Now, along comes a brand that could challenge that. "For guitars with brighter pickups, such as those on our '60 Strat replica, the response is more or less perfect"
Juketone Amplifiers hails from the UK, with manufacturing in China to keep the costs down. The company's Royal Blood 10 model is inspired by the late-50s narrow panel tweed Princeton, using a single 12AX7 preamp valve driving a 6V6 for around five watts' output power, with a 6Z4 rectifier valve instead of the original 5Y3. It's worth pointing out here that the 6Z4 comes in two flavours - Chinese and American - and while they do the same job, the pin-outs are different, so they can't be swapped. Behind the nicely covered tweed cabinet and brown grille is a very solid welded-steel chassis with the electronic components hand wired to a tag board, and chassis-mounted valve bases. No PCBs here; it's a simple circuit with around 20 resistors and capacitors, and the quality of wiring is very good. With power delivery coming from a single Celestion G10, the Royal Blood 10 is good-looking, if a little chunky, and robust enough to stand up to any abuse. We break out some of the best tone machines we can lay our hands on to test the Royal Blood, including a '72 Les Paul Custom and a Fender Custom Shop 1960 Strat. 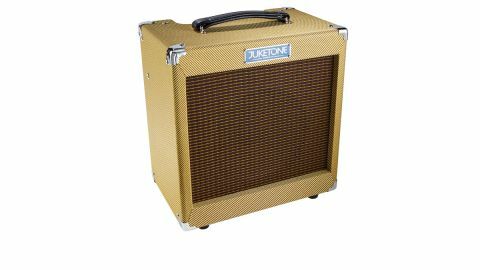 The Juketone's warm, throaty voice suits both guitars equally well - although we feel it could do with a touch more presence in the upper frequencies. The tone control still works, but for guitars with darker, warm-sounding pickups, the Juketone needs a dash of extra zing to lift the highs. For guitars with brighter pickups, such as those on our '60 Strat replica, the response is more or less perfect. Setting the amp up couldn't be simpler: turn up the volume and adjust tone to taste. The Juketone stays clean up to roughly halfway - after, it doesn't really get louder, just more overdriven: it's instant early ZZ Top, Dominos-era Clapton, The Royal Scam-era Carlton and many more. The Juketone sounds great, and while it doesn't have the finesse some original Princetons and boutique replicas offer, the bottom line is this: £279. There aren't many hand-wired pure valve tweed replicas for that price, and you'd be hard pressed to buy a DIY kit of this quality for less. If you want to improve the high-end performance, a decent alnico speaker like Jensen's popular P10R will get you most of the way, as well as being more historically correct.